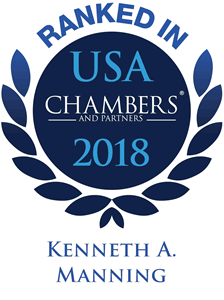 Mr. Manning has experience in bet-the-company corporate and commercial litigation, including dissolution proceedings, employment termination disputes and controversies involving the sale of goods and services. In addition to personal injury and wrongful death claims involving products liability, workplace accidents, negligence and environmental exposure experience, Mr. Manning has prosecuted and defended class actions in both state and federal courts. Mr. Manning also has experience in challenges to governmental actions, including taxes and assessments, as well as actions for declaratory relief. Mr. Manning also concentrates his practice in the area of education law and is the leader of Phillips Lytle’s Education Practice Team.